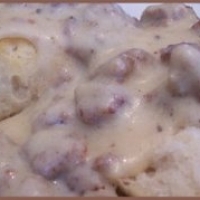 This sawmill, or sausage gravy is made with milk or cream. After cooking the sausage, leave about 3 tablespoons of fat in the pan, with the sediment. Sift or sprinkle in about 3 tablespoons of flour (over medium heat), and stir until very lightly browned. Pour in a cup of milk, season with salt and pepper, and keep stirring until it's thickened. If too thick, add more milk. I'm always interested in gravies! FIVE! You can't beat some good old gravy and buttermilk biscuits! It is a Sunday morning favorite around my house and of course the good old redeye gravy. This is mighty, mighty good! A good ole southern favorite!